As rumors continue to swirl around LinkedIn’s possible IPO, the professional social network is steadily adding useful features that help transcend the platform’s technology into other applications. LinkedIn recently launched two-way integration with Twitter and also rolled out a plug-in to pull in your LinkedIn contacts within Microsoft Outlook. And today, LinkedIn is opening up its API to start letting developers make applications that tap into LinkedIn’s social network. While LinkedIn is releasing 11 different APIs, they fall into three distinct categories. First, developers will be able to let users easily access their information, profiles, connections and messages via oAuth login. The second functionality is to give users the ability to make actionable decisions about information, but letting them message their LinkedIn contacts, post updates, accept contacts and more. And the third piece of the puzzle is search. So developers will now be able to embed LinkedIn search in other applications. The social network’s search engine was re-launched last year and has done over one billion queries in this year alone. Over the past year, LinkedIn has made select business development partnerships with technology companies for integrations, such as IBM, Microsoft, Research In Motion, and Twitter. While these partnerships created additional channels for LinkedIn’s platform, the opening up of the social network’s API is no doubt going to expand its presence across the web, perhaps representing a new level of growth for the social network. LinkedIn has already tested the API with several developers and applications are already going to be launching in the near future. 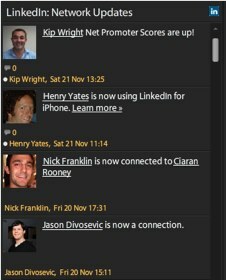 Twitter, MySpace and Facebook client TweetDeck will be integrated with LinkedIn in its next version. From the client, you’ll be able to see a stream of updates from your contacts, view profiles of contacts and comment and message contacts directly from TweetDeck. Posterous, Box.net, and Ribbit will all launch LinkedIn integrations in the near future as well. LinkedIn’s VP of search and platform products, Adam Nash, told me that over the past year, the network has received 4,000 requests from developers to integrate LinkedIn with their applications. Nash says that this is the first step for LinkedIn to become an open ecosystem and there are future plans for additional APIs to be released down the line. 50 million users strong, LinkedIn could expand its already powerful growth with development of third-party applications. It’s a no-brainer for LinkedIn to open up its API. As Twitter’s platform has shown, an open ecosystem produces innovative and sometimes, extremely popular, products around a product. And it doesn’t hurt to have a loyal developer community as well.